3. There were the days when the world looks India a country of snake-charmer, But now, due to our country’s young talented generation, we charm computer mouse, not the snake. 4. 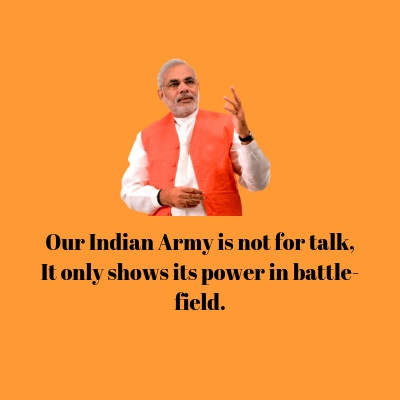 Our Indian Army is not for talk, It only show its power in battle-field. 5. Our Aim is to develop Gujarat for the development of India. 6. we are here with the intention, not with only promises. 7. Yoga is Not only about Asanas, It is much more. It is a Blend of Knowledge, Work, and Devotion. 8. we do not need Acts But Action. 9. We are not here for any positions but for a responsibility. 11. Once We Decide we have to do something we can go miles Ahead. 12. The mind is Never a problem, Mindset is. 13. It is important how we view the youth of our nation. To simply consider them as new age voter will be a big mistake. They are the new age power. 15. In My life MIssion is Everything. NO Ambition. Even IF I was a MUnicipal Chairman, I would have worked as hard as a CM. 16. In Democracy, People’s verdict is always final and we all have to accept it with Humility. 17. I will make such a wonderful India that all Americans will stand in line to get a visa for India. 18. I Don’t Carry The Burden of the past of the Madness of the Future I live in The Present. 19. The youth of India wants to find solutions to the nation’s problems. They want results that are quick and credible. They are blessed with phenomenal energy and this energy will bring very good results for the nation. 20. Yoga is Not only about Rog Mukti. but also Bhog Mukti. 21. I can promise you. If you work 12 hours, I will work for 13. If you work for 14 hours, I will work for 15 hours, why? 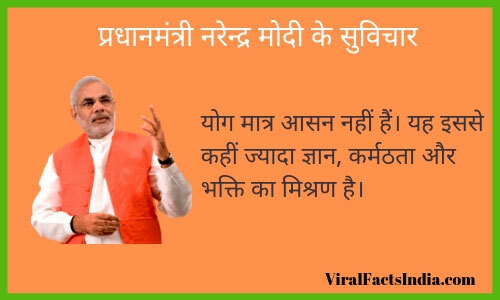 Because I am not a pradhan mantri, but a pradhan sevak. 22. In Congress rule, one has to be in a queue for everything right from getting ration, essential commodities, and employment. In fact, Congress has become so used to queues, that it says even Afzal Guru’s file is in queue. 23. I come from a poor family and I want the poor to get dignity. We want to start a movement for a clean India. If we have to build a nation, let us start from the villages. 24. Only those who keep walking get sweet returns, look at the sun’s perseverance – dynamic & always on the move, never dormant… hence keep moving. केवल वो जो निरंतर चलते रहते हैं बदले में मीठा फल पाते हैं, सूरज की अटलता को देखो- गतिशील और लगातार चलने वाला, कभी ठहरने वाला नहीं ….इसलिए बढ़ते रहो. 25. Each one of us has a natural instinct to rise, like a flame of the lamp. Let’s nurture this instinct. 26. In a democracy, people’s verdict is always final and we all have to accept it with humility. 27. An Opportunity to work is good Luck for me. I put my Soul into it. Each such Opportunity Opens the Gates for the Next One. 28. Ones we decide we have to do something, we can go miles ahead. 29. Coming age is the age of knowledge. However rich, poor or powerful a country be if they want to move ahead, only knowledge can lead them to that path. 30. Don’t dream to be something but rather dream to do something great. 31. For every policy, they have a precedent. My grandmother did this, my father did that and my great-grandfather did something else. Is this how you run a country? 32. I want to ask parents when daughters turn 11 or 14, they keep a tab on their movements. Have these parents ever asked their sons where they have been going, who they have been meeting? Rapists are somebody’s sons as well! Parents must take the responsibility to ensure that their sons don’t go in the wrong direction. 33. The life of Gautama Buddha illustrates the power of service, compassion and, most importantly, renunciation. He was convinced that material wealth is not the sole goal. 34. The world has changed. We can’t think about our development journey isolated from the world. 35. I did not get an opportunity to die for the country, but I have got an opportunity to live in the country. 36. Can someone tell me, whatever we are doing, have we asked ourselves if our work has helped the poor or come to benefit the nation in any way? We should come out of the ‘Why should I care’ attitude and dedicate ourselves to the nation’s progress. 37. By getting an opportunity to serve society, we get a chance to repay our debt. 39. The 21st century is the century of knowledge. Knowledge, science, and education will have the power and strength to embrace the entire universe. 40. When approached right, citizens never fail to shoulder their responsibilities. 41. 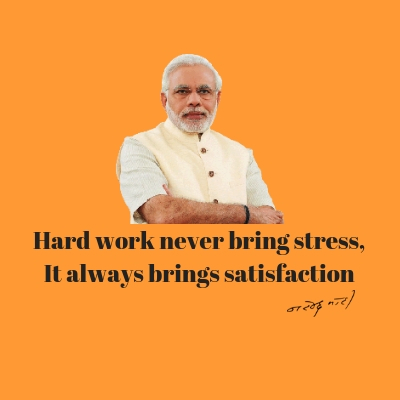 Hard work never brings fatigue, it brings satisfaction. 42. Let work itself be the ambition. 43. Each one of us has a natural instinct to rise, like a flame of the lamp. Let’s nurture this instinct. 44. Good governance with good intentions is the hallmark of our government. Implementation with integrity is our core passion. 45. Social media is reducing social barriers. It connects people to the strength of human values, not identities. 46. During exams, sleeping is vital but more important is the quality of sleep. 47. Ones we decide we have to do something, we can go miles ahead. 48. The greatest quality that a person possesses is the self – belief. If you believe you can, you can.If you believe you won’t, you most certainly won’t. 49. Good governance with good intentions is the hallmark of our government. Implementation with integrity is our core passion. 50. I did not get an opportunity to die for the country, but I have got an opportunity to live for the country. 51. I come from a poor family and I want the poor to get dignity. We want to start a movement for a clean India. If we have to build a nation, let us start from the villages. 52. A perfectly healthy man can contract a lot of ailments if he starts suffering from diabetes. Bad governance is worse than diabetes. 53. Salt is not the sole requirement for life but without it, life also cannot run. Like salt has an indispensable place in our life, we can give a similar place to yoga. 54. I always say the strength of democracy lies in criticism. If there is no criticism, that means there is no democracy. And if you want to grow, you must invite criticism. And I want to grow; I want to invite criticism. 55. All religions and all communities have the same rights, and it is my responsibility to ensure their complete and total protection. My government will not tolerate or accept any discrimination based on caste, creed, and religion. 56. An opportunity to work is good luck for me. I put my soul into it. Each such opportunity opens the gates for the next one. 57. Don’t dream to be something but rather dream to do something great. 58. Many countries which do not know our language, tradition, or culture, are now connecting to India through Yoga. The practice, which connects body, mind, and soul, has played a big role in binding the world too. 59. Coming age is the age of knowledge. However rich, poor or powerful a country be, if they want to move ahead, only knowledge can lead them to that path. 60. No form, no manifestation of knowledge, is senseless. 61. Social media is reducing social barriers. It connects people to the strength of human values, not identities. 62. During exams, sleeping is vital but more important is the quality of sleep. 63. Dreams are not seen when you sleep, dreams are those that don’t let you sleep. 64. No country can move forward with half-hearted resolutions and tied dreams. A new India is rising. It has a clear vision and willpower to achieve its dreams. 65. Today India is being lauded world for it is not because of Modi but due to 125 crore Indians. 66. Coming back to one hometown and receiving such a warm welcome especially is special whatever I am today is due to the values I have learned on this soil among you all in Vadnagar. 67. Swachata is a Puja for me. Cleanliness is a way to serve the poor of India. 68. Do not compete with others, compete with yourself. 69. Sardar Patel United the country territorially. We too must undertake efforts and further the spirit of oneness in society. 70. Every citizen wants to do something for the betterment of the society and for the progress of the country. Contributions made by people have the power to further the growth of the nation. 71. We do not just lay foundation stones but ensure timely completion of projects so it benefits the people. 72. India is changing. India’s standing the global stage is rising and this is due to Jan Shakti. 73. There is no life without creativity. Let our creativity strengthen our nation and fulfill the aspirations of our people.